A spicy tasting herb, useful for green salads or flavouring egg, fish, meat or tomato dishes. Reputed to be a natural tranquilliser. HHA - Half hardy annual. Height 30-45cm (12-18"). 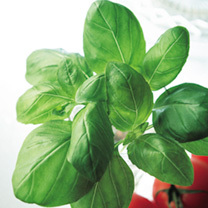 Toby's Tip: "Basil will keep greenfly and other pests away from tomatoes and other crops in the greenhouse. Brush the leaves with your hand to release the smell and it's an instant insect repellant! ".